There are many varieties of grapes both red and white, some used in winemaking while others are used for eating. The grapevine is a deciduous woody plant which grows its fruit in clusters. This cluster of white grapes growing on a grapevine in the Okanagan has a future in wine. Bonitas Winery grows both red and white grapes which are later used in winemaking. The climate and soil of the Okanagan Valley are perfect for growing grapes and there are numerous vineyards throughout the region. Clusters of white grapes growing on grapevines at Bonitas Winery, Summerland, Okanagan-Similkameen Region, Okanagan, British Columbia, Canada. 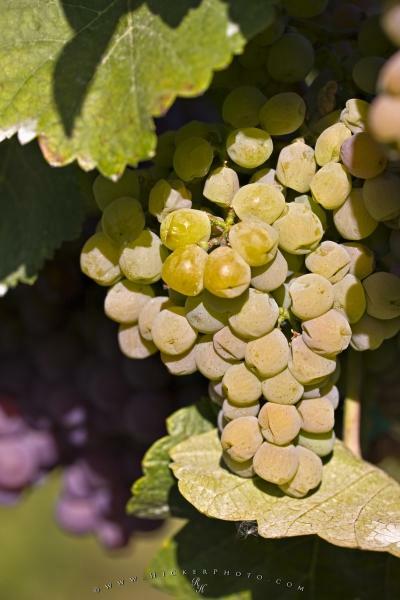 Photo of a white grapes on a grapevine in the Okanagan Valley, British Columbia, Canada.